Are you interested in learning more about how to run and manage your WordPress website? WordPress Site Management may be just the thing you’re looking for. This class is a followup to the popular WordPress 101/WordPress for Beginners class that has been offered previously. Designed for those who have a basic knowledge of WordPress, the program cover how to manage your WordPress website. 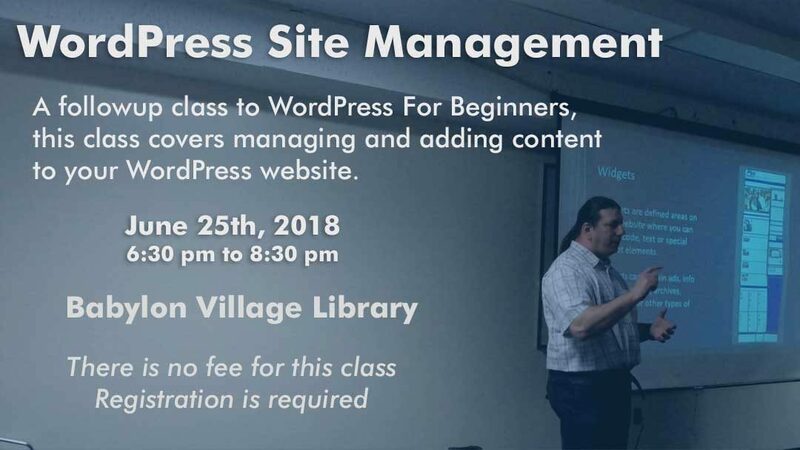 There will be a demonstration of how to keep your site updated, search for and add plugins and themes from the WordPress repository and perform other, basic site management tasks. You’ll also learn how to add content including working with images, adding and updating pages and posts, and using categories, tags, and strategies to organize your site. The class will be given on Monday, June 25th, 2018 from 6:30 PM to 8:30 PM at the Babylon Village Public Library. There is no fee for this class, but registration is required.